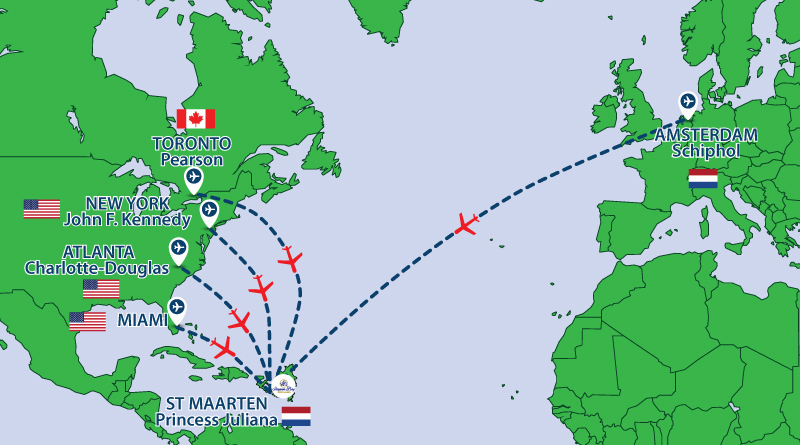 St. Maarten is an important gateway to the Caribbean with direct flights from New York, Miami, Philadelphia, Charlotte, Chicago, Newark, Atlanta and Boston in the United States, San Juan in Puerto Rico, and Toronto, Montreal and Halifax in Canada. There are also regular flights from Amsterdam and Paris in Europe. Your starting point will be the ultra-modern Terminal Building at the Princess Juliana Airport (SXM). The airport has not only become a landmark, it handles about 2.5 million passengers annually. Its four-level, fully air-conditioned and spacious modern facilities span an area of 30,500 m2. St. Maarten is a regional transport hub with flights throughout the Caribbean. If island hopping is on your itinerary, there are regular connections to and from Aruba, Curaçao and Bonaire, Antigua, Anguilla, St. Croix, St. Kitts/Nevis, Saba, St. Eustatius, St. Barts, St. Thomas, Tortola, Dominica, Grenada, St. Lucia, St. Vincent, Barbados, Trinidad and Tobago and Guyana. There is something in the air and there are not only planes, the Princess Juliana International Airport in St. Maarten has something incredible and transcendental to offer to its visitors in the years to come. The island is also an important cruise ship destination and all the major cruise lines call in at Philipsburg and Marigot. There are ferry links and catamaran trips to the neighboring islands of Anguilla, St Barts and Saba. Planning your next trip to St. Maarten? Book your accommodations online and get the best rates!